The Original Wailers pride themselves on continuing Marley’s legacy with the help of two guitarists who shared international stages with the legend himself, Al Anderson and Junior Marvin. They formed the group in 2008, with nearly instantaneous success, chiefly thanks to the global audience Marvin and Anderson had already carved for themselves. With Marvin departing from the project in 2011, Anderson became the thread connecting The Original Wailers to Bob Marley, a connection that remains strong to this day. 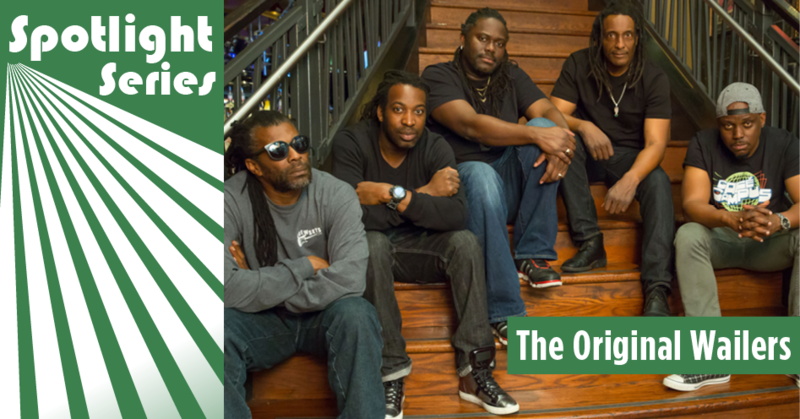 With Chet Samuel (lead vocals), Omar Lopez (bass), Howard Smith (drums) and Adrian Cisneros (keyboards) rounding out the lineup, the Original Wailers’ sound is an instant throwback to old-school roots reggae, bolstered by a strong rhythm section and evergreen melodies. Anderson’s guitar expertise has had an understated yet profound influence not just in reggae, but across a wide range of genres, including blues, soul, rock & roll, jazz and more. Born in New Jersey, Anderson trained alongside the likes of Pat Methany and Al DiMeola at Boston’s Berklee College of Music. Early on, he worked with big names in the industry, like Chris Wood of rock band Traffic and ‘80s popstar Steve Winwood. It was Jamaica, however, that called Anderson’s name, solidified by his employment at Island Records, the country’s premier roots, reggae and rocksteady record label. Bob Marley, who had just formed a band with The Wailers, was looking for a guitarist who could bring the expressive elements of blues rock and soul to reggae, and upon meeting Anderson, looked no further. For years, before Marley’s music entered the global mainstream, Anderson found himself in “Trenchtown,” Jamaica, with little-to-no luxuries, working tirelessly to craft a new reggae sound with Marley and other luminaries like Bunny Wailer and Peter Tosh. In an interview with Ambient Light Blog, Anderson discusses his humbling experiences. “I got lucky (when I met Marley.) I had never met an artist that took his environment, it’s degradation, and a limited amount of musical skills to the level that he did.” Anderson’s characteristically emotive playing can be heard on internationally cherished and platinum award-winning hits like “No Woman, No Cry” and “Redemption Song.” After Marley’s untimely passing in 1981, Anderson made a return to session music, performing on more critically acclaimed records like Lauryn Hill’s hip-hop classic, The Miseducation of Lauryn Hill, plus songs by Ben Harper, UB40 and more. With The Original Wailers, Anderson continues his ever-growing passion for the genre that started it all––reggae. In 2013, the band was nominated for a GRAMMY Award for Miracle, an album that displayed the nuanced balance of positive, catchy songs alongside anthems that speak of hardship and shared struggles. That balance exemplifies the essence of roots and reggae music, a sound that The Original Wailers are undeniably at the forefront of. Make sure you RSVP for both Carson City and Stevens Point for this rare opportunity to watch reggae legends revisit classic sounds!